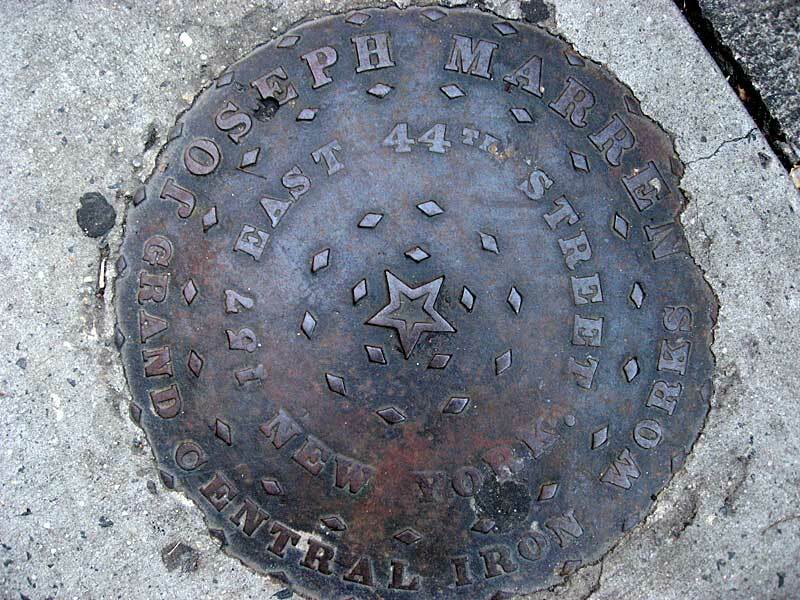 In 1865 Joseph Marren, in business on 48th St. near 3rd Ave., was taxed on his possession of iron castings valued at $52.50. The tax was $3.18. This was in the month of September, 1865. An annual list for the year 1866 recorded Joseph Marren, manufacturer, at 119 E. 48th St., taxed $10 for the year. Trow's New York City Directory for 1868 locates Marren at this address. The following year the address of his business was 159 E. 44th St. The foundry stayed at this address (either 157 or 159 E. 44th St.) from 1869 to 1897. This ad for Joseph Marren / Grand Central Iron Works appeared in Trow's New York City Directory for 1895. Joseph Marren was an immigrant from Ireland ca. 1851. He was recorded in the U. S. Census of 1860, age 26, living in New York's 18th Ward with his wife, Catherine, and two small children. His occupation was "house smith." In the 1870 census he was 31 years old and a "housefinisher." Housefinisher probably meant that he supplied (and maybe installed) decorative iron work. In the 1880 census he was 45 years old and his occupation was "Iron Rail Maker." At this time he lived at 348 E. 55th St., Manhattan. He also appears in the 1900 U. S. Census, age 67, retired. His son, James P. Marren, lived with him at 320 E. 126th St., Manhattan. James P. Marren gave his occupation as "Iron Goods Salesman." Louis B. Gescheidt's son, Jacob Gescheidt (1891-1944), was a contractor / builder, whose business at 142 E. 43rd St., was identified as the Grand Central Contracting Co. in Polk's New York City Directory in 1925. In 1917 Jacob Gescheidt registered for the World War I draft when he lived at 1215 Wheeler Ave., Bronx, NY. He was 25 years old, born 7 June 1891 in Brooklyn, N. Y., and was in business for himself as a building contractor at 142 E. 43rd St., Manhattan. Both Louis Gescheidt and Jacob Gescheidt appear in the 1920 U. S. Census. Louis Gescheidt lived at 110 E. 87th St., Manhattan, and described his occupation as "Iron Ore." Jacob Gescheidt lived on Wheeler Ave., the Bronx, and described his occupation as "Architect Construction." This ad for the Grand Central Iron Works appeared in the Real Estate Record and Builders' Guide, 7 March 1914. An earlier ad from 1912 says that L. B. Gescheidt spent 15 years working in the repair department at the Cornell Iron Works. This ad for L. B. Gescheidt's Grand Central Iron Works appeared in Polk's New York City Directory for 1916. An ad for Jacob Geschedit's contracting business appeared in the same issue. Some Joseph Marren and Grand Central Iron Works architectural foundry marks can be seen on the Marren foundry marks page.